-- (Continuation of previous film) Comatose Neo (Keanu Reeves) was lying on a medical table in the ship The Hammer, directly across from the "only one" who survived a massacre at Zion. He was a suspected traitor: Bane/Agent Smith (Ian Bliss). It was thought that Neo, who was not "plugged in," might be in The Matrix. Meanwhile, the underground city of Zion was again being threatened within 20 hours (by midnight) by another attack of tunneling machines and Sentinels. Neo found himself at the 'Mobil Ave' subway-train station [mobil=anagram for limbo] - "trapped in a place between this world and the Machine world" - in the place where programs were smuggled into and out of the Matrix. He learned from an Indian family (Rama-Kandra and wife Kamala, both programs) and their beloved program-daughter Sati (Tanveer K. Atwal) that the Trainman (Bruce Spence), employed by the French Merovingian (Lambert Wilson), controlled whether he could leave ("Down here, I'm God"). Trinity and Morpheus met with the Oracle (Mary Alice), (changed in appearance in exhange for Merovingian's permission to smuggle Sati undetected into the Matrix), the "mother" of the Matrix, who confirmed that Neo's "link is controlled by a program called the Trainman." To free Neo, they met with the Merovingian, who was dining at Club Hel, and were offered a swap: Neo, for "the eyes of the Oracle." Trinity refused the offer and the stand-off ended with Neo's release, signaled by an arriving train carrying lover Trinity (Carrie-Anne Moss). Neo also visited with the Oracle asking: "Tell me just what the hell is happening to me" - she revealed that his powers were manifested because he was connected to the Source, the Machine City's mainframe. She expressed how she wanted the war to end "one way or another" and also forecast: "I see the end coming, I see the darkness spreading. I see death." Only Neo could save the future of both worlds (the Machine City and the Matrix), by standing up to all-powerful Agent Smith (Hugo Weaving) who "won't stop until there's nothing left at all." The Oracle described Smith to Neo: "He is you. Your opposite, your negative." After Neo left, multiple Agent Smiths (he was now able to replicate himself indefinitely) arrived and took over the Oracle, taking her powers of precognition as he assimilated himself into her. To accommodate Neo's need for a hovercraft to carry out his mission, Niobe (Jada Pinkett Smith) gave him her ship the Logos, to travel to Machine City with Trinity. As part of their overall military strategy to save Zion from a machine invasion, Niobe (with Morpheus as her co-pilot) planned to navigate back to Zion in the Hammer craft through a complex series of back tunnels, avoiding Sentinels (or "squids"). On board Neo's ship, Bane revealed himself as Agent Smith and then during a struggle blinded Neo by cauterizing his eyes with a spliced electrical cable. Neo could still "see" Bane/Smith ("I can see you") as orangish light and killed him by decapitating him with a crow-bar, although Bane warned: "It's not over, Mr. Anderson." Neo was able to sense AI intelligences as fiery objects, when they navigated on to the 'scorched-earth' Machine City - but they were overwhelmed by Sentinels and lost power in an electrical storm. When they crash-landed, Trinity lost her life and gave Neo one last kiss before expiring. Meanwhile, Zion was readying the defense of its dome and outside docks with giant robotic Armored Personnel Units (APUs) loaded with bombs, led by Captain Mifune (Nathaniel Lees), who valiantly fought but lost his life against giant drilling machines in the monumental conflict. Gate 3 was opened just in time to allow Niobe's craft to enter and disperse the Sentinels with EMP (but with disastrous consequences for Zion's resources) - until the next wave of the assault. Neo bargained with the Deus ex Machina, the Machine's intelligence, for peace (an end to fighting in Zion) in exchange for fighting against and eliminating once and for all the rogue program Smith. He warned: "The program Smith has grown beyond your control. Soon he will spread through this city as he spread through the Matrix. You cannot stop him. But I can..."
Neo was connected to the Matrix while he fought a monumental battle against Smith, who claimed he could already foresee his victory (with his newfound powers of precognition that he had appropriated from the Oracle): "You can't win. It's pointless to keep fighting...This is my world. My world!...Wait, I've seen this. This is it. This is the end...Everything that has a beginning has an end, Neo." The Oracle was speaking those words through Smith. [Note: This was the first instance that Smith called him Neo rather than Mr. Anderson.] 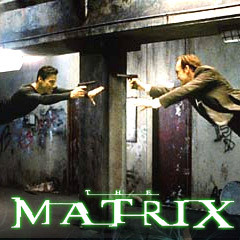 When Smith feared it was a trick, Neo replied: "You were right, Smith. You were always right. It was inevitable." Neo tricked Smith into letting him 'unbalance the equation' - by letting Smith win, and accepting his own 'end'. Smith assimilated Neo with a punch to his mid-section and then asked: "Is it over?" - Neo/Smith agreed with a nod. Neo's plugged-in body, back in Machine City, glowed a golden color as it surged in energy that turned to a bright white light - destructively blasting all the Smiths into nothingness, as Smith complained: "It's not fair." The Machines had gained control of Smith through Neo's jacked-in body - and destroyed him. The Source confirmed Smith's deletion: "It is done." Neo was taken away by the machines to assimilate his code into the mainframe. Conditions returned to normality - the Zion war ended ("the war is over"), peace came as the Sentinels withdrew, and the Oracle and Sati were restored within a world devoid of green tint (the sun was shining in a blue sky over the city). The film ended with a short discussion between the Oracle and the Architect (Helmut Bakaitis), the creator of the Matrix, who said: "You played a very dangerous game." She replied: "Change always is." He begrudgingly promised that "the others" (humans who were still plugged in) who wanted out of the Matrix "will be freed." Sati, a child born in the Matrix, made a beautiful sunrise for Neo, reformulating the Matrix as she saw fit. The Oracle declared with the film's final line that she didn't know what would happen: "Oh no, no I didn't. But I believed. I believed." With a production budget of $150 million, and box-office gross receipts of $139 million (domestic) and $425 million (worldwide). Set-pieces: the entrance into Club Hel, Bane/Agent Smith's fight to death with Neo, the major battle between Sentinels-drilling machines and the forces of Zion, and Neo's final airborne struggle against menacing Agent Smith in the rain to defeat him.